Students and staff at Leeds City College could be forgiven for not returning to the classroom this week after coming face-to-face with zombies on campus. But term started as normal after the Easter holidays with the ghastly goings on all in the name of art, thankfully. 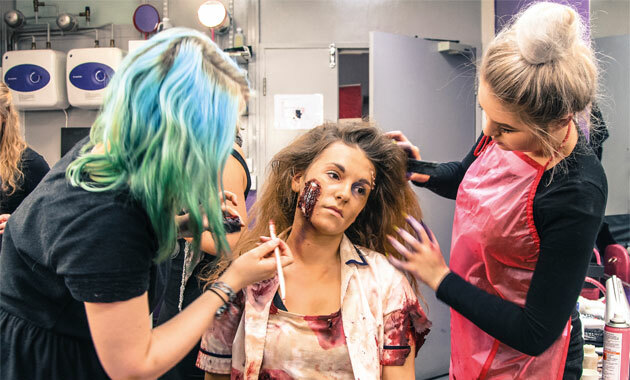 Production arts learners brought to life the figures as part of a special effects event called Backstage Pass hosted by the college and inspired by the US drama The Walking Dead. Fellow learners were transformed for seven zombie-infested scenes, ranging from a wedding and maternity ward to an aeroplane and a circus. Main pic: Jadean Mosley, aged 18 (centre), who is studying BTec extended diploma in musical theatre, being transformed into a zombie by BTec extended diploma in production arts students Abigail Oldfield, 18 (left), and Kaytlin Thompson, 16 (right).